You’ve probably heard of medical alert systems before but you might not have given them serious consideration. However, they are well-worth that consideration especially if you are or are worried about a senior in your life. 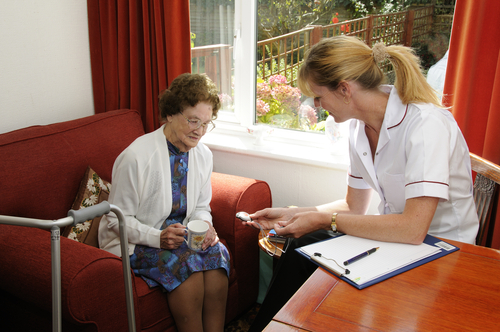 The first problem often thought of when it comes to medical alert systems for seniors is the chance of a severe fall. This isn’t just a cliche either. For seniors, falling is a real risk. According to the National Council on Aging, falls result in over 2.8 million of the injuries treated in emergency rooms each year. Within that statistic, more than 800,000 resulted in hospitalization and over 27,000 proved fatal. One thing that can help this statistic become much less scary is to make sure that seniors can get help immediately if they fall. If seniors live alone or are at home alone and fall without being able to get to a phone. This is where medical alert systems come in. When seniors have something on them that calls help for them at the push of a button, they are less likely to suffer as severely as if they have to wait for treatment for injuries. With a medical alert system in today’s world, seniors have access to features that they haven’t had in the past. Instead of a simple way to keep an emergency call ready, they also feature benefits such as location trackers, check-ins, and even carbon monoxide detectors. Devices with a GPS tracker are especially useful if a senior is suffering from dementia or Alzheimer’s Disease and happens to get lost without any aid nearby. Check-ins are also a handy feature for seniors as well. This way, if something were to happen to a senior in the case that they couldn’t call for help for a reason such as loss of consciousness, they aren’t left alone in those cases either. Another useful feature that some of these systems have is a reminder to take medications that seniors might be on. Many of these also have alerts in the case that medication is missed or too much is taken. In these cases, an emergency contact is might be alerted alongside emergency services if they are necessary. While medical alert systems can be a great safety precaution for a senior’s health, they offer a deeper, emotional benefit as well. In particular, they can offer independence. When it gets close to time to recognize that you can’t operate daily life with the same independence you once did, it can be frustrating and discouraging, to say the least. With the rise of technology, though, there are things that can help you retain this independence. One of the biggest of with is the use of medical alert technology. The biggest question when deciding if someone can remain independent is usually “what if something happens?” With a medical alert system, seniors are more protected from the possibility of things going wrong when they are living on their own. As we’ve noted, a big part of medical alert systems is that they need to be easily accessible from anywhere at any time. This is why almost all medical alert systems are wearables such as pendants or bracelets. The even better news is that they aren’t as bulky or obvious as they once were. Seniors today can benefit from more discreet designs if they’d like so that they have their medical alert system handy without worry or embarrassment. No matter how important something is, many of us still have to worry about if it’s affordable. So, you might be thrilled to realize that many medical alert systems are made to be affordable. Many of these systems work on a monthly billing cycle with some rates as low as a dollar a day. When someone is in trouble, the last thing they want to worry about is figuring out how to call for help. This is why medical alert systems are made to be easy to use. They usually aren’t made to be complex and even ones that many features typically work with just the press of a button. There is often a fear of what would happen in the case that technology goes awry. What if the batteries die? What if it breaks? Since their creation, these systems have been improved upon. For most, this means extended warranties and back-up power systems help to keep seniors safe no matter what. At the end of the day, if nothing else, medical alert systems offer you peace of mind that you might not otherwise have. You know that you or the senior you love has access to the help they could need at all hours of the day no matter who is – or isn’t – around. Medical alert systems are not a one-size-fits all option, but they provide excellent benefits to many seniors who would like to feel secure while living independently. They’re absolutely worth considering.